Pressure washers direct a high-pressure stream or jet of water against a surface to clean, descale, degrease or prepare a surface. Pressure washers may use either cold water or hot water and steam to perform their function, and the water is often mixed with various cleansers, detergents or solvents. They are used for cleaning, or for the demolition of products made of metal, wood, concrete, stone, plastic, glass or other building materials. Pressure washers are available as complete machines or systems, or they can be purchased in component form and built from the ground up, or to replace worn out parts. Specific available parts include the gun or lance, the pumping unit, separators or reclaimers, filtration system, blast cabinets and blast rooms, water blast wheel, and water storage tank. The gun or lance directs the stream fluid (air or water) through a nozzle and at the appropriate region of the workpiece. Some pressure washers have wear resistant nozzles and optional abrasive injectors to provide wet sandblasting capability. The pumping unit is the pressure generator used to force out the carrier fluid at high velocity. 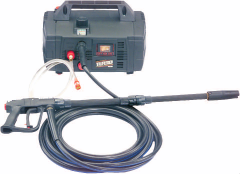 Plunger-type intensifier pumps are commonly used to generate high-pressure water for water jet cutting and wet or water abrasive blasting for non-abrasive pressure washing or rinsing. Crankshaft driven plunger pumps are commonly used for pressure generation. Crankshaft driven plunger pumps may be more efficient in electrical energy costs compared to intensifiers, but at high pressures (>20,00 psi) seals must be periodically replaced. These plunger pumps also provide a virtually ripple free pressure source in comparison to intensifiers. An accumulator may be required to smooth out pressure fluctuations if an intensifier pump is used. Dust collection or filtration systems remove fine particle sizes of abrasive, swarf, grease or other blasting waste (removed scale or stock in the form of dust or fine swarf) that would otherwise contaminate the environment. Pressure washing cabinets are glovebox-like vessels that hold the workpiece and the blasting process. Wash cabinets usually consist of a chamber with glove ports, viewing window and internal lighting. The workpieces rest on an open grid that allows used wash fluid to drop through for recycling. The operator may hold the washing nozzle on the end of a lance. The workpieces rest on open grid flooring that allows used water and/or cleanser to drop through for recycling or treatment. The water blast wheel propels and directs a wide stream of abrasives and carrier (water or air) at the appropriate region of the workpiece. Water tanks or hoppers are used by pressure washers for the storage of dry abrasive grains, blasting media or abrasive-water slurry mixtures. Abrasive blast machines and sandblasters clean and prepare surfaces by directing a stream of abrasive particles against a part or a surface. Abrasive jet and waterjet cutting machines are used to cut sheet materials or remove materials from a surface by generating a focused stream of fluid mixed with abrasive particles. Water jetting equipment and water blasters direct high pressure (10,000+ psi) streams of water against a surface to clean or cut the material.